Our professional concrete driveway staining in Laguna Beach CA can make your driveway a work of art. First impressions matter. This is especially true when it comes to real estate, and the driveway is often one of the first parts of the property people see. You certainly don’t want a plain, utilitarian concrete driveway detracting from the upscale appearance of your home or business. Make sure your driveway is an asset, not a liability, by coloring it with concrete driveway staining in Laguna Beach CA. Beautiful: Whereas paint would give you a flat color, concrete driveway staining in Laguna Beach CA penetrates into the concrete to create rich, deep, dimensional color. Our water-based stains are available in a wide range of hues, and you can also blend and layer stains, use stencils, or add cut borders to create the exact look you want. Quick: Most of the time, making a dramatic impact on the appearance of your home or business is a major undertaking lasting weeks or months. But concrete driveway staining in Laguna Beach CA can be done in a matter of days, giving you almost instant improvement in your curb appeal. Cost-Effective: Concrete driveway staining in Laguna Beach CA is a particularly good investment when you’re dealing with an old, discolored driveway. With the right combination of stains, you can cover many types of imperfections at a fraction of the cost of pouring new concrete. You can also create the look of expensive materials like stone or tile without breaking your budget. 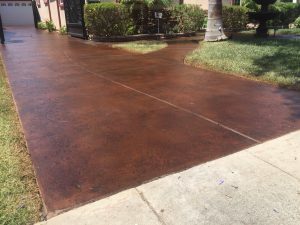 Concrete driveway staining in Laguna Beach CA is definitely not a DIY job, as there is a lot of skill involved in prepping the concrete, mixing colors, and applying the stain correctly. At Fuller Concrete Staining, we know the best techniques and products to use on old or new concrete to ensure a strong bond between the stain and the concrete and give you a professional-looking result. You can trust us to help bring your design vision to life, and your satisfaction with the quality of our work is always guaranteed. To learn more about our concrete staining services, please call 310-944-9099 today or fill out on online contact request. We’ll be glad to provide a free quote.